SLR and RMS coming off the boil. Will be looking to re enter if either can get below 70 cents. CanadaÃ¢â‚¬â„¢s RNC Minerals (TSX: RNX), the company that last month unearthed more than 9,000 ounces of high-grade gold from a single blast at its Australian Beta Hunt mine, has recovered the first specimen. Mincor and Gold Fields arenÃ¢â‚¬â„¢t the only companies with assets in the region, with Independence GroupÃ¢â‚¬â„¢s (ASX: IGO) Long operation placed on care and maintenance during the June quarter after final ore reserves were mined. Long has been mined since the 1970s, with Western Mining Corporation operating the asset until 1999. Independence Group secured the mine in 2002 and extracted around 137,000t of nickel during its 16 years of ownership. Although on care and maintenance, Independence Group has committed funding to exploration in the area, which could breathe new life into the asset. Meanwhile, Panoramic Resources (ASX: PAN) owns the nearby Lanfranchi nickel mine that has been on care and maintenance since 2015. Panoramic managing director Peter Harold told Small Caps RNCÃ¢â‚¬â„¢s gold haul was a Ã¢â‚¬Å“fantastic discoveryÃ¢â‚¬Â. Similar to Mr Muccilli, Mr Harold said it was not uncommon to find gold in Kambalda. He added that gold has been identified at Lanfranchi in the past, but the rights belonged to Gold Fields. Ã¢â‚¬Å“It will certainly lead to more interest in Kambalda,Ã¢â‚¬Â Mr Harold noted. Traditionally, the region has been primarily exploited for nickel. It remains to be seen if other nickel plays will begin actively exploring for that Ã¢â‚¬Å“spectacularÃ¢â‚¬Â Ã¢â‚¬Å“once in a lifetimeÃ¢â‚¬Â bonanza gold find that could see them pulling out $16 million-worth of gold out of the ground in just four days like RNC at Beta Hunt. 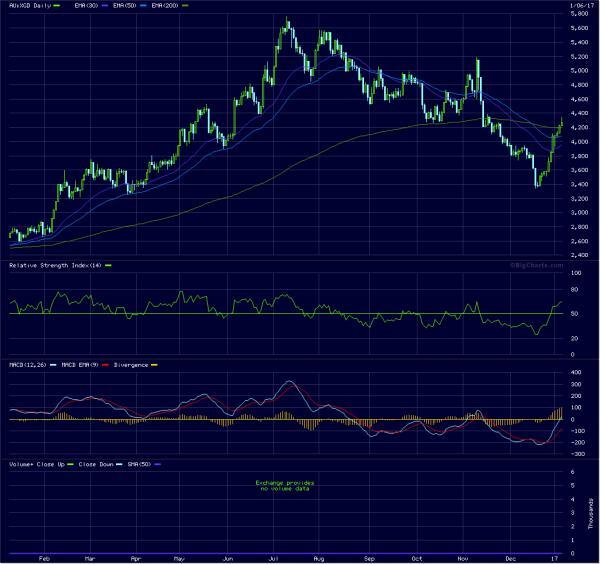 Here's a chart on the ASX gold sector, XGD. It's up 27% in the last month and has just regained the 200dma. It looks quite bullish by the looks, let's see where it gets to in the next few months. Worth a listen. Note the HUI index is lower now than it was in 1996.......that's what he is talking about (actually he mentions the XAU index but same thing really). Interesting new article by Adam Hamilton below - the gold sector is already up significantly over the last month and he sees a replay of what happened last year (a huge increase). I largely waited on the sidelines through the last quarter of 2016, once the pattern broke down, and redeployed in gold stocks like NST and SLR at the beginning of December, a little early as the mid-December swoon was a nasty one. The ASX XGD gold sector is up 26% since the mid-December low, with individual mid-cap stocks up as much as 40%, eg SLR, RSG, RMS, SAR. We now await the USD weakening (crowded long USD trade) and the US sharemarket correcting which will keep gold going upwards. I note the HUI/Gold ratio has strengthened significantly since the mid-Dec low, ie the gold stocks have risen much more (18.5%) than the price of gold (5.5%). But is still extremely low compared to the longer-term average as the article demonstrates. From what Hamilton says, if conditions result in a mean reversion overshoot we're looking at a 262% increase from here. Last year the HUI increased from 99 to 286 between mid-January and the end of July = 190%. And the gold sector is even more hated this year than last year which is a great contrarian signal. It wouldn't surprise me though if we had a breather now until after the Trump inauguration. The gold miners' stocks are rocketing higher again after suffering a rough few months. Following sharp selloffs on gold-futures stops being run, the Trumphoria stock-market surge, and a more-hawkish-than-expected Fed, this battered sector had largely been left for dead. But gold stocks' strong fundamentals finally overcame the dismal herd sentiment last week, paving the way for this sector to shine again in 2017. This "shine again" assertion likely seems dubious to casual observers, since the gold miners' stocks suffered a miserable Q4'16. The leading HUI NYSE Arca Gold BUGS Index plunged 21.1% in a quarter where the benchmark S&P 500 broad-market stock index surged 3.3%. Naturally gold miners' profits are fully dependent on gold prices, and this metal fell 12.7% in Q4 which proved one of its worst quarters ever. Thus no sector has been more out of favor in recent months than precious metals. Gold and therefore gold-stock bearishness abounded, with bullish outlooks dwindling near nonexistent. But viewing gold stocks solely through the extremely-distorted post-election lens is a serious mistake. Despite their sharp Q4 selloffs, this sector as measured by the HUI led the markets by still soaring 64.0% higher in full-year 2016! If any other sector like technology or financials or even energy had seen such dominating performance last year, the financial media would be endlessly extolling it. But not gold, it's just too contrarian. 2016 was a solid year for gold, with its 8.5% rally nearly catching the S&P 500's 9.5%. As of Election Day, gold was still up 20.3% year-to-date which trounced the 4.7% of the S&P 500. Gold really did shine last year! The highlight of gold's first up year since 2012 was certainly the first half. Between a 6.1-year secular low in mid-December 2015 on highly-irrational Fed-rate-hike fears and early July, gold powered 29.9% higher in its first bull market since 2011. And over roughly that same 6.5-month span, that leading HUI gold-stock index soared 182.2% higher! Gold stocks' stellar performances dominated the markets last year. Nearly a year ago as the HUI fell to miserable 13.5-year secular lows, I advised that a major new gold-stock bull was imminent. Last January's gold-stock prices were fundamentally absurd relative to this sector's underlying earnings power even at then-prevailing gold prices. A similar extreme sentiment-distorted pricing anomaly just happened last month. So 2017's gold-stock setup is just as bullish as 2016's proved! Sadly most traders succumbed to the recent groupthink bearishness to foolishly bury their heads in the sand regarding gold stocks. The same thing happened a year ago. Speculators and investors alike are always ignoring the most-beaten-down sectors which usually have the greatest upside potential. So it's incredibly important to get up to speed on gold stocks as 2017 dawns, before they are bid far higher again! Maintaining perspective is the key to overcoming the dangerous herd emotions of greed and fear. They convince traders to wrongly buy high and sell low, ultimately leading to catastrophic losses. But armed with the big picture, it is much harder to fall into the trap of extrapolating recent performance out into the indefinite future. This first chart looks at the gold-stock bull over the past year rendered in HUI terms. After nearly tripling in just over a half-year by early August, the red-hot gold stocks were indeed due for a serious correction as I warned in July. Infected with rampant greed and wildly overbought, this sector soon sold off hard in August. Sharp corrections in bull markets are totally normal and very healthy, as they bleed away excessive greed to keep sentiment balanced. After that gold stocks stabilized in September. But as October dawned, an anomalous adverse event slammed them out of the blue. The gold-futures speculators who dominate short-term gold trading must deploy stop losses to protect themselves from these hyper-leveraged trades. They had a big mass of stops set near $1300, which had proven strong support for gold since it soared in late June on that Brexit-vote surprise. That was a logical level to protect capital. After drifting lower in late September, gold finally slipped into that futures-stop-infested zone around $1300 in early October. The consequential stops triggering soon cascaded, and gold's sharp selloff became self-feeding. 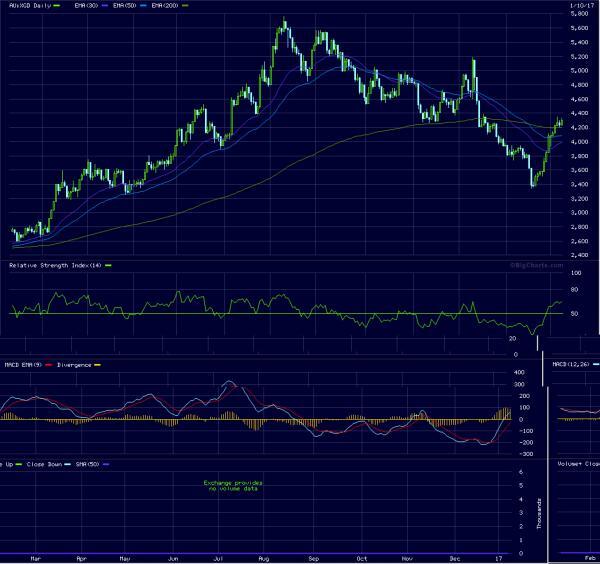 The resulting mass stopping quickly spilled into gold stocks, causing the HUI to plummet 10.1% on October 4th! While painful, that surprise event was an extreme anomaly that wasn't sustainable. Indeed gold stocks soon stabilized again, with buyers returning near their key 200-day moving average and parallel bull-market-uptrend support in October. Gold and its miners stocks climbed on balance right into election night, when they soared in futures and overseas trading as Trump took the lead in Florida. All pre-election market behavior strongly suggested gold would surge if Trump somehow managed to win. American gold futures blasted 4.8% higher from that afternoon's close on election night, hitting $1337. And over in Australia gold stocks were soaring 15%+! But later that very night as Clinton conceded to virtually eliminate the risk of a contested election, the US stock markets started to rally sharply out of limit-down 5% S&P-500-futures losses. And as the anti-stock trade, gold was hammered on that stunning reversal. Gold is a unique asset that moves counter to the stock markets, making it essential for diversifying stock-heavy portfolios. Gold investment demand naturally surges when stock markets weaken, as gold's gains help to offset stock losses. But when stock markets seemingly do nothing but rally indefinitely, investors soon forget about prudently diversifying portfolios. So sharp stock rallies temporarily kill gold demand. As gold dropped in the days after the election surprise on the Trumphoria stock-market rally, the gold stocks were blitzed again with another mass stopping. On November 10th and 11th, the HUI plummeted 7.8% and 8.0%! These horrific losses were the final straw for most gold-stock investors, destroying their will to remain in such a volatile sector. So gold stocks went from loved in mid-2016 to despised in mid-November. But again perspective is crucial. How often does a radical outsider like Trump run for and actually win the US presidency? Nothing like that has ever happened before. Any market selloff driven by an extreme anomaly is never sustainable. Gold stocks didn't plunge because their fundamentals were failing, but because an epic surprise post-election stock-market rally seduced investors out of gold back into lofty stocks. Again since that extreme gold-stock selloff was purely sentimental and had nothing to do with the hard fundamental realities of the gold-mining industry, these battered stocks quickly stabilized. Despite the stock-market euphoria and resulting gold antipathy, the HUI ground sideways for an entire month from mid-November to mid-December. The unjustified extreme gold-stock selling had largely exhausted itself. But on December 14th, the Fed surprised on the hawkish side so gold and gold stocks took another hit. While traders had universally expected the Fed to hike rates for the second time in 10.5 years, they did not expect elite Fed officials to forecast three more rate hikes in 2017 instead of two previously. So yet again gold stocks were crushed in emotional fear-drenched selling, ultimately pummeling the HUI to 163.5. Those were essentially February levels, last seen on the first trading day of March. While that post-Fed selloff wasn't an extreme anomaly like the early-October and post-election ones, it was devastating to already-tattered gold-stock psychology. An astonishing 2/3rds of gold stocks' bull market in the first half of 2016 had been erased! The gold miners were universally hated, the pariahs of the investment world. But that didn't make any sense at all. As of its very closing low the day after last month's Fed decision, the gold stocks as measured by the HUI were still up a fantastic 47.0% year-to-date! That compares to just 10.7% for the S&P 500, and this sector likely remained the top performer in 2016. In any other sector in all the stock markets, traders would be salivating at buying the dip after such a supremely-anomalous selloff. Instead of fretting about a 42.5% drop over 4.4 months largely driven by two unrepeatable events, traders should've been remembering gold stocks' powerful first-half gains. Back in July and August when the gold stocks were high, investors and speculators alike were falling all over themselves to deploy capital to chase gains. But they were nowhere to be found when these miners' stocks plunged to fire-sale prices. I can't help but marvel at this glaring disconnect. I've spent decades actively speculating in the stock markets, and have shared our contrarian research via my financial-newsletter business for 17 years now. The most-shocking revelation I've learned is how susceptible to groupthink psychology the vast majority of investors and speculators are. They love to buy high when greed reigns, but refuse to buy low as fear mounts! Last summer traders were eagerly rushing to buy gold stocks high, to chase the strong gold-stock gains. Yet just a few months later when these very-same elite gold miners were deeply on sale for 40%+ off, these same traders who loved them last summer wanted nothing to do with them. What is so hard to understand about buying low and selling high? Buying low means embracing fear when few others will buy. Fully wrapped up in popular bearish sentiment, traders totally lost sight of the gold-stock fundamentals in much of November and December. I did my best to help them overcome that, spending long weeks in late November and early December digging deeply into hard gold-mining fundamental data from these companies' just-published third-quarter financial reports. Yet that super-important research fell on deaf ears. I dug deeply into the top 34 component companies of each of the dominant gold-stock ETFs, the GDX VanEck Vectors Gold Miners ETF and the GDXJ VanEck Vectors Junior Gold Miners ETF. It turned out in Q3'16 these elite GDX major gold miners reported average all-in sustaining costs of $855 per ounce. And the elite GDXJ junior gold miners weren't much worse at $911 per ounce. These numbers are crucial. All-in sustaining costs reveal what it costs the gold miners, individually or as an industry, to maintain and replenish their current operations. Between Election Day and year-end, the gold price averaged $1177 per ounce. Extending to all of the dismal Q4'16, that climbed to $1218. And even at worst after the Fed decision, gold only briefly fell to $1128. None of these gold levels were remotely close to threatening $855! Even on gold's worst day in Q4, the elite gold miners of GDX were still earning big profits of $273 per ounce. That equates to an amazing 24% profit margin that most industries would sell their souls for. At the Q4 average gold price, these earnings were fully a third higher at $363 per ounce! Yet the irrational fear was so great that gold stocks were battered back to prices first seen in July 2003 when gold traded near $360. Stop and think about that for a second. Just a couple weeks ago, in a quarter where the gold miners likely earned $363 per ounce mined after all expenses, their stock prices were trading at levels first seen 13.4 years earlier when the entire gold price was less than current profits! The only words that come to mind to describe this are ridiculous, ludicrous, and absurd. The recent gold-stock prices weren't righteous. For 7 weeks in a row I wrote comprehensive essays explaining this extreme gold-stock anomaly, and thus what radical upside the gold stocks had. As always I put my money where my mouth was, buying and recommending 8 new specific gold-stock and silver-stock trades on December 20th and 4 more on December 27th to the subscribers of our weekly Zeal Speculator newsletter. We also added new call options. On December 31st I extended the buy recommendations to our monthly Zeal Intelligence newsletter with 5 new gold-stock and silver-stock trades. The incredible opportunities in these beaten-down gold stocks trading at fundamentally-absurd prices were explained in depth in real-time to our subscribers as they happened. Prudent contrarian traders who listened instead of ostriching are now making out like bandits. Being so close to year-end, I didn't expect the new investment buying to flood into gold stocks until the new year. But it's always important to get deployed before everyone else catches on, as that's when the buy-low opportunities are the greatest. And out of the blue on no news, gold stocks started rallying on the day before the long Christmas weekend. That strong contrarian buying persisted for most of last week. And as 2017 dawned this week, investors immediately started looking for deeply-undervalued sectors to position in for this new year. And the still-beaten-down but-quickly-recovering gold stocks won a sizable portion of those capital inflows despite their tough fourth quarter. As of the middle of this week, in less than 3 weeks since its extreme post-Fed low the HUI has already catapulted an amazing 17.6% higher! As always the stocks of the smaller gold and silver miners with superior fundamentals we specialize in enjoyed gains amplifying those seen in the major miners dominating the HUI and GDX. And despite the sharp rebound gold stocks have seen in recent weeks, they are just getting started. Odds are this sector will once again prove one of if not the best-performing sector in all of 2017, building on 2016's strong gains. As of the Wednesday data cutoff for this essay, the HUI was still only trading at 192.3. That merely took it back to levels seen in the immediate post-election plunge. The gold stocks still remain well below their strong 200dma and bull-market-uptrend support zones, and 32.3% under their early-August bull-market high per the HUI. 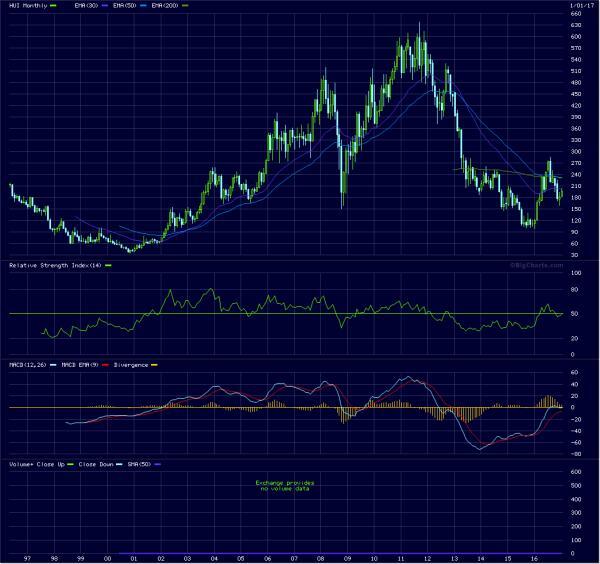 The gold stocks' upside potential from here remains vast, as evidenced on all fronts. In addition to battered technicals, gold-stock sentiment was crushed to hyper-bearish levels late last year. It will take a long time and a lot of rallying to eradicate that excessive fear and restore sentiment balance to this sector. And fundamentally, gold stocks remain wildly undervalued relative to the profits they can spin off at prevailing gold prices. A quick proxy for that is the HUI/Gold Ratio, rendered here. I've often discussed this chart extensively in the past, including nearly a year ago when calling a new gold-stock bull the very week 13.5-year HUI lows were witnessed. In a nutshell, the HUI/Gold Ratio distills the key fundamental relationship between gold prices, gold-mining profits, and therefore gold-stock price levels into a single line. Gold-stock prices tend to trade in a range relative to underlying gold levels. On the day after the Fed's hawkish surprise last month, the HGR fell to 0.145x. In other words, the HUI closed at 14.5% of gold's close. Outside of the extreme record HGR anomalies seen in the last half of 2015, that was among the lowest HGR levels ever. Back in mid-January 2016, the HGR briefly fell to an all-time low of 0.093x. But such crazy lows are unsustainable sentiment-driven anomalies, temporary distortions. As of the middle of this week, the HGR has still only recovered to 0.165x. From 2009 to 2012, which were the last normal years between 2008's stock panic and 2013 when the Fed's radical QE3 started to levitate the stock markets and crush gold, the HGR averaged 0.346x. So merely to mean revert back up to normal levels relative to today's prevailing gold prices, the HUI still needs to rally another 109% from here! But that's far too conservative for a couple major reasons. All mean reversions out of extremes tend to overshoot proportionally in the opposite direction. So the abnormally-low HGR levels in recent years driven by extreme fear will almost certainly yield to abnormally-high levels in coming years fueled by excessive greed. A proportional overshoot yields a topping HGR target of 0.599x, for another 262% HUI rally. And gold itself isn't going to remain at the artificially-depressed low levels seen since the election. Gold-futures speculators will return with a vengeance as the wildly-overcrowded long-US-dollar trade reverses dramatically in 2017. And gold investors will flock back as the bubble-valued US stock markets inevitably roll over into their long-overdue bear. Thus gold is looking at 2017 gains far better than those seen last year. As gold mean reverts higher, gold-mining profits greatly leverage and amplify its gains. Gold-mining costs are largely fixed when mines are planned. That's when engineers decide which ore bodies to mine, how to dig to them, and how to process that ore. This determines how much capital investment is necessary to bring mines online, huge fixed costs. After that, variable operating costs don't fluctuate too much. Plugging higher gold prices into any HGR target, either an unlikely strict mean reversion or a very-likely proportional overshoot, yields commensurately higher gold-stock price targets. The math is simple. Take any gold level you find likely in the coming years, multiply it by 0.346x or 0.599x, and you get the HUI levels that can support. The battered gold stocks are likely only just starting a mighty new multi-year bull market! You can certainly ride the coming massive gold-stock gains in those leading GDX and GDXJ gold-stock ETFs. But at best they will mirror sector gains, as they are over-diversified and held back by too many underperforming gold stocks with inferior fundamentals. A carefully-handpicked portfolio of elite gold and silver miners with superior fundamentals will see gains dwarfing those of the gold-stock ETFs and indexes. At Zeal we've literally spent tens of thousands of hours researching individual gold stocks and markets, so we can better decide what to trade and when. As of the end of Q3, this has resulted in 851 stock trades recommended in real-time to our newsletter subscribers since 2001. Fighting the crowd to buy low and sell high is very profitable, as all these trades averaged stellar annualized realized gains of +24.1%! In order to reap success like this, you have to stay informed all the time. You can't abandon gold stocks when they are weak and out of favor, as that is when the greatest buying opportunities arise. An easy way to stay abreast is through our acclaimed weekly and monthly newsletters. They draw on our vast experience, knowledge, wisdom, and ongoing research to explain what's going on in the markets, why, and how to trade them with specific stocks. For only $10 per issue, you can learn to think, trade, and thrive like a contrarian. Subscribe today, and deploy in our new stock trades before they power far higher! The bottom line is gold stocks are really set to shine in 2017, as early trading is already proving. This sector was just battered to fundamentally-absurd price levels in the wake of the election surprise. With gold-mining earnings remaining strong, the recent gold-stock lows were fully driven by extreme bearish sentiment. Such fear anomalies never last, always paving the way for massive mean reversions higher. The latest one has already started, and gold stocks still have easy potential to at least double from here even at low prevailing gold prices. But as the overbought stock markets and US dollar inevitably reverse lower this year, gold's own bull will resume. Higher gold prices will greatly increase the profitability of gold mining, and fuel a major new multi-year gold-stock bull. As always the early investors will earn fortunes. CopyrightÃ‚Â©2000-2016 Zeal Research All Rights Reserved.